Smart home technology gets more advanced and less expensive everyday. But who is using it? Why? And how can an integrated platform add value to what these devices already offer? Our team, four designers from different backgrounds, was eager to get to work on this exploratory project. We read dozens of articles and research papers and scoured the internet for competitors. We also heard from a subject matter expert. It seemed to us that smart home technology users were young, affluent, and motivated by a desire to own the latest and greatest devices. We drafted our user research plan to investigate these assumptions. We also wanted to know more about users' relationship to home in general. Users we interviewed weren't motivated by the shiny appeal of new gadgets. Instead, they bought smart home technology for peace of mind–often in response to an incident that involved a loved one or pet at home alone. We came away from six hours of interviews with a ton of information and a growing sense of empathy for the real challenges facing users. With the industry on a growth trajectory, we were excited to uncover ways to add value through better integration. We mapped out the interview data, looking for insights and patterns. We noticed a through line connecting users' smart home purchase trigger events. Users felt a need to better provide for pets and loved ones at home while maintaining a busy career. Smart home devices promised to at least give them real-time information. And with that knowledge users hoped to gain peace of mind. We synthesized our user insights into a persona, the Busy Caregiver. This persona kept us grounded in empathy for our user throughout the design process. Next, we mapped out the smart home technology adoption journey of the Busy Caregiver. This process helped us understand the current solutions available to our user and explore opportunities to improve upon them. As technology-enabled devices reach into more areas of the home, the types of information and actions available to users remotely will grow. The fragmented nature of current smart home software puts an undue burden on the user to make sense of the information. Users need to see all their smart home data in a unified context. We also needed to define what principles would guide a successful solution. The following five principles were designed with our Busy Caregiver in mind. Gives user a sense of control through clear, customizable options and features. Emphasizes core functionality while being mindful to limit "extras." Presents information and options in context of what the user cares about. Provides suggestions and just-in-time information to make tasks easy. Uses friendly language and visual elements to convey warmth and welcome. Next we diverged to brainstorm how our design could address the problem. After writing user stories and scenarios, we came together as a group to decide on a unified approach. For concept testing we wanted to explore both getting insight and taking action. In testing users saw immediate value in the camera alert feature. However, allowing remote access to guests didn't resonate as much. Users enjoyed the general idea of taking action remotely. Most testers weren't familiar with how a smart lock works and they didn't connect with the use case. This emphasized the importance of keeping actions in context. Moving forward we decided to present actions in the context of information. For example, when viewing a camera alert the user should have access to relevant actions such as making a phone call for help. We also wanted to be intentional about our content strategy. How did users think about smart home product categories? To find out, we gave users cards labeled with smart devices and asked them to sort the devices into groups. Once they'd sorted the devices, we gave them blank cards and asked them to name each of their categories. There was a lot of variation in how users grouped devices and what they named their categories. As a result we decided to avoid grouping devices into categories. Instead, we chose to represent them individually throughout the app. 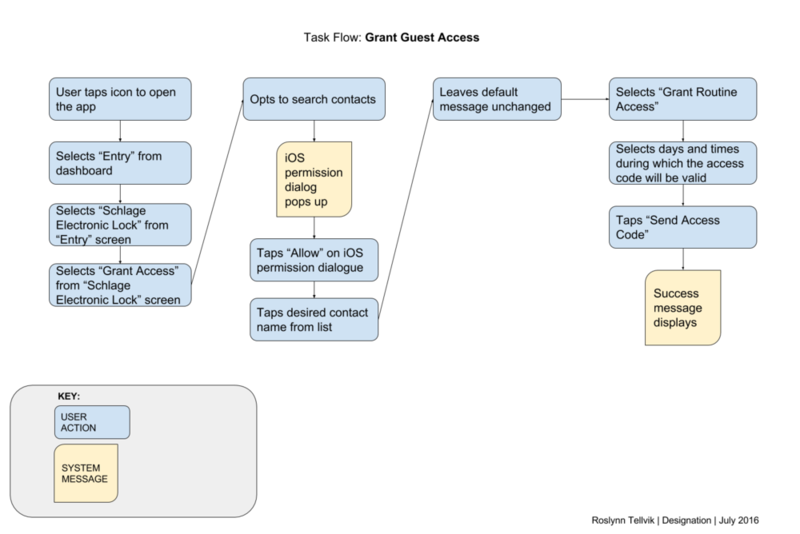 For this iteration we decided to include account creation, onboarding, camera alerts, and a feature called Scenes. Scenes are groups of settings saved together, like a playlist for home device settings. Most smart home device managers offer this feature. We each built an Axure prototype with a different approach to the same task flows. From a usability standpoint we wanted to know how successful users would be at completing key tasks. We also wanted to know what UI patterns were most useful. We recorded testers as they clicked through the prototypes and followed the think aloud protocol. A moderator gave prompts to the participant at the beginning of each task flow. An observer took notes. A. Users liked to see the number of steps, and their progress, on one screen. B. Informal, positive language helped users feel confident and engaged. C. Users preferred persistent tab navigation for the dashboard. D. Users were really engaged by the live camera feed. 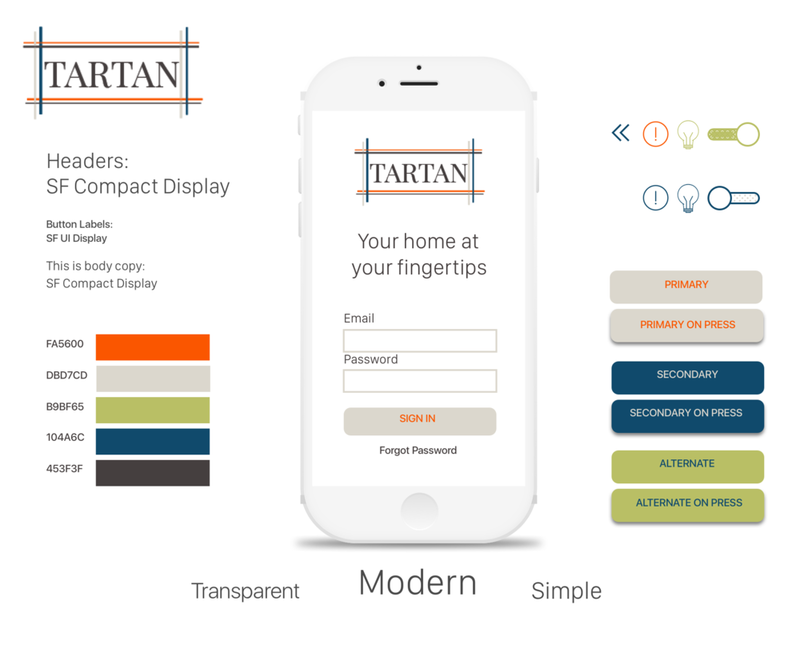 We named our app Tartan to signify that the app offers users a way to weave together all their devices in one place. In doing so it helps users weave together their away life and home life. First we looked at our competitors from a visual and branding standpoint. Most brands focused on the futuristic promise of smart home technology. With our user in mind we aimed to infuse the future with inviting warmth and a sense of accessibility. With a high fidelity prototype we planned to test several visual directions for the UI. We also hoped to gain insights we could use to improve the UX. I explored a few color palettes and UI element styles. I chose the direction that was most simple and inviting. Then I built out more than 40 screens and created a prototype using Invision for the final round of user testing. We tested four unique approaches. Each one was inspired by a different design principle. Users preferred the visual direction of the prototype shown above, far right. Feedback also helped us identify two problems with the UX. Users were confused by the whole concept of Scenes. When we explained the Scenes feature they weren't interested. We decided to remove Scenes after finding no data to support its inclusion. When interacting with the Alerts feature, users reported feeling a bit of alarm. We sought to reduce this sense of alarm by renaming the feature Notifications and using a friendlier icon set for the Notifications dashboard. These were improvements, but they didn’t go far enough. The Emergency Call button on the Camera Alert detail screen still gave users a feeling that something must be very wrong. We questioned the purpose of the Emergency Call button and decided that the action presented was too drastic. Most users would call a neighbor or relative to check on their loved one at home before calling 911. We changed the button text to Quick Call. We also moved Settings to the tab navigation where Scenes used to be. In Settings we made it easy to add Quick Call contacts. The final prototype reflected the insights we gained as a result of four rounds of user research and testing. We presented our process and prototype to a judges panel of UX/UI Designers. Overall, they appreciated how we synthesized our research, addressed a specific need, and continued to iterate on key features even at the later stages of our process. Moving forward I'd focus on nailing down the technical aspects of syncing devices. Next, I'd extend the ways in which Tartan weaves together away life and home life for caregivers. For example, the app could sync with unconventional devices, like health monitoring products. Then, if the caregiver is alerted to a potentially dangerous change in vital signs, she'd also have an immediate view of her loved one via live camera feed. As a team we embraced the challenge of incorporating our diverse perspectives while staying true to the user's needs and motivations. I'm proud of how we collaborated to design a way for the working caregiver to be present beyond just calling to check in. I used everything I learned to my next project conducting UX research, strategy, and design for a medical wearable sensor startup, ExoWear. Thanks for making it this far. If you'd like, have a look at more case studies, view my resumé, or connect with me on LinkedIn.